… authentic politics is… the art of the impossible – it changes the very parameters of what is considered ‘possible’ in the existing constellation. I find something which consoles me a bit for having walked… this road of the impossible… I find something as immaterial, yet earthly, terrestrial, in the shape of a circle… a meridian. Preserved on a very small piece of paper is an image, yet another image – the latest in an endless stream – of one of the world’s greatest cities: London. But this one – like striking beauty glimpsed and repeatedly conjured up – is memorable, vivid, indelible. It is a fresh London face – with all the ethical force that that implies – drawn by George Vertue1 and entitled ‘An Explanation of the Several Forts on the Line of Communication’ which were built around London during the English Civil War of 1642-3. Vertue’s make-over of the capital first appeared in Maitland’s huge History of London (1738)2 and it remains the best – and almost only – map of the fortifications that so impressively protected the city. The forts were a system of colossal defences, dug from London earth which was formed into mounds, walls, ditches and trenches to defend the city from attack. The attackers were King Charles I and his royalist army, determined to regroup and recover London, the city of Parliamentary revolt. The enclosing ring, or ‘Lines of Communication’, was the connecting tissue between forts – sightline, defence, message route and an early stab at a network for the disparate capital. As with Paris, there are countless unrealized plans for the formalizing, restructuring and organizing of the growing metropolis of London. Unlike Paris, smashed into classical shape by Baron Haussmann, London – ‘its only identity a lack of a clear identity’3 – never received the imprint of the large-scale urban planner (not, at least, after its Roman inception). Not Wren’s post-Great Fire plans, not Queen Anne’s Fifty Churches Act, not various GLC plans, not Richard Rogers’ riverizing plans (all of which were partial in any case). London developed piecemeal, not ad hoc so much as ‘in hock’ – to the private estates and enterprising interests of the court, the church and the aristocracy. Burnt, bombed, unclassical, unwritten London is the greatest example of an unruly bursting-forth – a hand-made mess of a world city. So Vertue’s image is an image of the only achieved formalization of a city that remains the epitome of unreadably chaotic expansion. This image, this piece of paper, these century-late estimations of the locations of thousands of tonnes of soil and wood, is all that remains of London’s greatest stab at form. It’s an image of London’s largest-scale construction, a defining monument to the city. A city and its spirit of hope. This is mid-seventeenth-century London, a time and place of intense political, cultural and social activity, a people in the process of constructing an international identity as an Imperial power, with all that flows from that – not least literally, along the Thames, that pre-industrial conveyor belt of Empire-to-come. This is the London of the old Old London Bridge, the thundering north-south route through Southwark and the City, rain-forested by churches and encrusted with the palaces of the court and the church. It is London before the Great Plague and Fire, of Old St. Paul’s, Westminster and Lambeth Palaces. A London of horses, river-boat crossings and tanneries, open sewers and spas, duels and archery, windmills and toll-gates, Marvell and Milton, of Dissenters and Levellers. It is a London on the cusp: the rigidities of feudalism melting into the more participatory democracy of constitutional monarchy and mercantilism. This is the densely signifying heart of London shorn of the later suburban sprawls of Islington, Hackney, Clapham, Bloomsbury, Chelsea or Kensington. A London without docks and associated industries, with marshland in Lambeth and Wapping, reservoirs in Chelsea, pesthouses for early plague victims out on a limb in the fields of Victoria and Clerkenwell, with open brooks cutting to the river banks north and south. This map contains the magnetic, hypnotic, addictive locus of all that we mean by the fabulously rich word ‘London’. Above all else, this is an image of Utopian enclosure, a city barricaded all around in support of a revolutionary new form of government, a circle of defiance, lines of commitment that forced life-and-death decision-making on its populace. It is an image of revolution and sudden change, with London as its home and closer than ever before to its people. It is also a map of something actual but no longer traceable, and this absence of physical trace rehearses the properly Utopian element of such an enclosure which is, strictly speaking, a non-place or un-place. And it is made mobile – mobilized – as a result. Today this en route Utopianism chimes perfectly with our contemporary experience of nonphysical – but, contra Paul Virilio,4 no less actual – virtuality. Just as we understand consciousness differently – no longer locked away in internal or inner space, but encoded and fluid (out there) – so too is reality infested with virtuality and vice versa. This enables us to conceive of new, mobile, dirty Utopian enclosures whereby limits are drawn and theorized within in ways that are physically traceless (but no less potently actual for that). This is a Utopianism written in time (time in space rather than space in time). It is a Utopianism, therefore, of dynamic form – as opposed to prescriptive schema. A Utopianism that is broken-down, miniaturized, cobbled together, as light and mobile as digital space, an insistent and necessary hope against hope. It is a dirty Utopianism that can take something elemental (like time) and transform it. In Wong Kar-Wai’s film Days of Being Wild5 the lead character eventually persuades a woman who is resolutely refusing his advances to spend a random minute with him in silence. After huddling together watching the seconds pass, he declares that from 16 April 1960 ‘we’ve been friends for one minute. This is a fact you can’t deny. It’s happened’ – he will always remember it. This act of memorializing forms the film’s narrative dynamic and it does prove unforgettable in peculiar ways. But it is also an act that exceeds its context; the political instability in Hong Kong at this time, and the totally dissolute, incoherent, listlessly ‘in-between’ lives that characterize the film and the period in which it was made – the 1990s (so brilliantly staged in Kar-Wai’s classic pair, Chungking Express and Fallen Angels). This is an ‘act proper’ in the Zizekian sense – a hysterical, decontextualizing act that precipitates qualitative change. This is so in terms of the film itself but also in terms of Kar-Wai’s reworking of the experience of the millennial city and its globalized cultural spaces. It is a Utopian act in a form and of a material available to us all. It is a bursting forth, highly mobile, unanchored Utopianism, technologically and spatially contemporary: a generative, radical act. It also invokes a notion of threshold in which such an act involves the destruction of what is (in this instance, the shiny static junkyard of postmodernity). It is modest but potent, elemental not sophisticated, individual yet incorporative. It is dirty Utopianism. Vertue’s image is one in which a revolutionary Utopia is identical with the city itself. It is an enclosure, a London with a very clear – and notably widely shared – image of itself as something formally new, something worth fighting for. 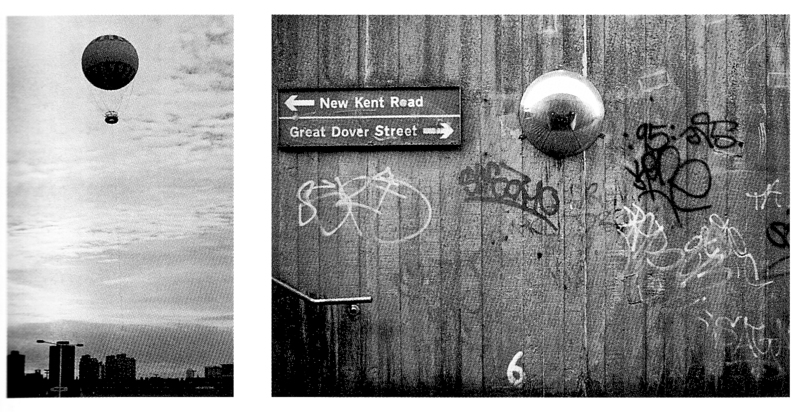 It is a battleground, a potential tabula rasa – since the city was threatened with an obliterative ‘sacking’ – as well as an example of how to think through the notion of London as a whole in the present, because what it involves is a mobility of mind, a proper grasp of the potential spaces of historical mud and contemporary virtuality. Fort-building or forting is synonymous with fighting: the construction of a shared identity worth fighting for. No one in seventeenth-century London was in any doubt as to the stakes involved in forting – this leap into the muddy dark – and no one knew where the first insurrectionary step would lead. We can and should understand future-talk as exactly this, a fuel of change, a strategic necessary projection and a formal dynamism that is enabling and generative. 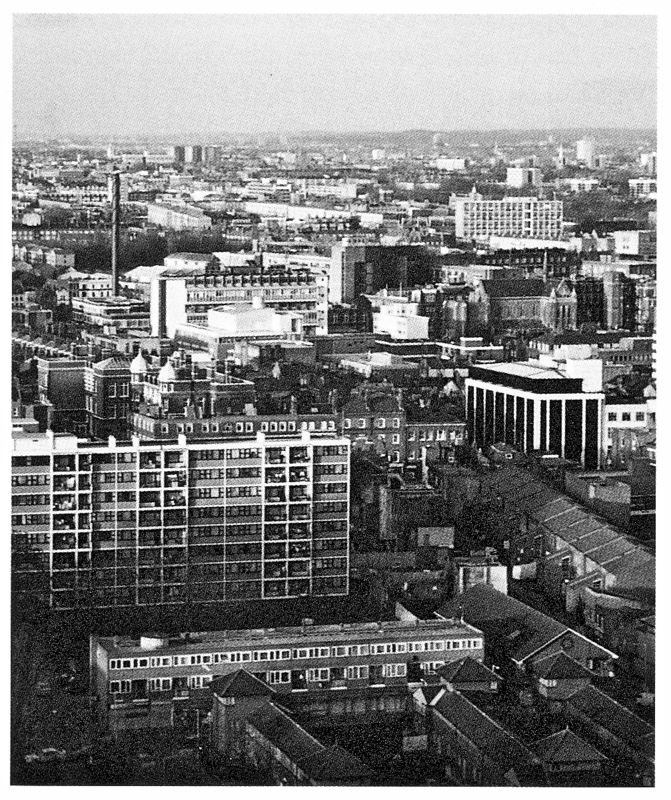 Today, George Vertue’s representation of London will enable me to construct the city as a threshold zone – a site where everything is at stake and everything becomes possible again. Through an uncanny relationship with other forms of Utopian enclosure and the communal investment of actual change, we will arrive at the present, equipped with technologies that are defined by their mobility in the realms – or threshold zone – of the potential/actual; a threshold zone that is multi-directional, constructive and destructive, unlimited, virtual, non-physical and ferociously effective against the world that we actually experience. His equipment was meagre: the shovel, the pick, the wagon, the trowel, the wheelbarrow – the simple tools of every race … before the mechanical age. His achievement was truly admirable. In place of grand narrative it [Thomas Carlyle’s Letters and Speeches of Oliver Cromwell, 1845] …offered a politics of the personal, in which spiritual economy – or what Carlyle… called ‘soul-effort’ or ‘soul-striving’ – replaced constitutional progress as the measure of worth. I approached to make the tour around about and descending to the lower end of Wapping there I beganne my circuit… close by the houses and the River Thames’  Lithgow encountered a ‘seven angled fort… erected of turffe and watles and earthenworke [as are all the rest] having nine portholes, and as many cannon; and near the top, round about pallosaded with sharpe wooden stakes, fixt in the bulwarkes, right out, and a foot distant from another, which are defensive for sudden scalets, and single ditched below, with a court du guard within. This is unofficial history, where sources are anecdotal, contingent and unstable. There is no trace of the forts built around the city of London to defend the parliamentary revolution from the King, because Parliament itself ordered their removal before Charles I was executed in 1649 (their erasure was completed by the Restoration of Charles II’s monarchy in 1660, which saw the disinterring and decapitating of Cromwell’s body, and produced the constitutional settlement that we inhabit today). So, while there are Acts of Parliament that protect sites of vital cultural heritage – such as the numerous remains of royal palaces – there is none that marks the system of defences built to protect that very same Parliamentary will. In trying to pin-point the historical matter we enter a philosophical loop in which we go back to a beginning only to find it is not there. To be precise: I have the word of one man prone to exaggeration – William Lithgow (successfully prosecuted for lying about his experience of the Spanish Inquisition);  an extremely loosely drawn map by William Stukeley (whose recovery of stone patterns at Stonehenge and Avebury for a Druid culture has long been controversial)  published in 1720; a series of fake drawings of the forts by a captain in Cromwell’s army;  glimpses by the reliable Daniel Defoe  of extant earthworks half a century later; and then street names, anecdotes and deduction based on what these clues tell combined with the certainty that the forts did exist, and that locations can be estimated from contemporary maps and records. This matters. As soon as you recognize the London in Vertue’s map you want to superimpose it on London today, but quickly you find that the sites and lines are contested. They exist in a domain of radical interpretation. It matters because this event and story is so fundamental to the story of the English and Britain, an identity that is up for grabs, on the cusp again. In the mid-seventeenth century the constitution was literally being fought over, the House of Lords vanquished, relations with Europe molten; in the early twenty-first century we see the dismantling of the English Empire in the UK, the beginnings of the end of the Lords and relations within Europe molten once more. Then and now, new national and pan-national identities emerge. Then and now new ways to think about identity in cultural, political and social terms develop. Notions of self, of citizenship, the relationship to a collectivity (today uniquely mobile but nevertheless still there), of what the emergent crowd is exactly, demand rearticulation. How such things are embodied in political terms (and so in terms of collective rights and responsibilities which are reinvested in projects such as social housing) becomes urgently significant as a result. The constructions of history are comparable to military orders that discipline the true life and confine it to barracks. On the other hand: the street insurgence of the anecdote. The anecdote brings things near to us spatially, lets them enter our life. I found the grasse growing deep in the royall Court of the King’s House. The resolution of the parliamentary Common Council provided for a bulwark and a half, with a battery at the north end of Gravel (now Wapping) Lane – close to the site of Hawksmoor’s church St George-in-the-East, completed in 1726 – Fort No. 1 on Vertue’s map. Lithgow proceeded northwards along the trench dyke ‘for all the Trenches are deep ditched about’, on through the fields towards the road leading to Essex via ‘Myle’ End Green (where he saw two other small defences), at Whitechapel. Here was a ‘nine angled fort only pallosaded and single ditched and planted with seven pieces of brazen ordinance, and a court du guard composed of timber and thatched with tyle stone as all the rest are’ – Fort No. 2. Turf, wattle, thatch, earthworks, timber stakes and ditches – the stuff of insurrection. Wapping Fort is the perfect example of insurrectionary mud. Elsewhere on London’s westside were the more urban chains and guarded road-blocks that are associated with the later rebellions in Paris. In the French capital it was more a case of insurrectionary cobble: in the 1830 revolution, over 4,000 barricades were built from 8,125,000 paving stones. Indeed this form of rebellion was one of the things that Haussmann aimed to end by the construction of wide, strategically connective boulevards throughout the city of Empire. In Paris, cobbles and furniture were missiles of protest on one side, while, on the other, organized spades and picks were agents of structural change. In London these came together to revolutionary effect centuries before Paris. Wapping, whose development had just begun, certainly had plenty of mud on its low-lying flooded river banks. The fort’s exact location is disputable, but one vital clue is a note, handwritten by Cromwell Mortimer, on a copy of Vertue’s map held in the King’s Topographical Collection at the British Library. Mortimer’s 1746 notes describe several forts (including White Chapel Fort) either still in existence or with visible remains, and advertise a distinction between dry and wet ditches according to variously coloured inks. While colours fade and, unlike ageless botanical specimens, cannot be revived, it is clear from this print that Vertue has shaded some sections of the lines that connect to the Thames in the same way as he shaded the river. An archaeological report by the Museum of London, confirms evidence of ‘wet’ ditches – 5.5 m wide and 1.4 m deep – at Newark Street where it meets New Road, part of the line of communications along the modern Cannon Street Road from Wapping Fort to White Chapel Fort (or Mount) immediately to the west of the Royal Hospital, at Mount Terrace. The wet ditches, which used the defence capabilities of re-routed Thames water, appear to have extended from halfway up Cannon Street Road to the river, then all the way along the South Bank’s notoriously marshy stretch, before heading northwards again to Tothill Fields (halfway up Vauxhall Bridge Road and to the east of Chelsea’s reservoirs). Since the purpose of the forts was to defend an expected attack, their sightlines were vital. The topography of the city was therefore a factor in their location and although it is not possible to recover completely the sense of seventeenth-century landscape, a number of the fort sites do reveal their virtues in this respect. Wapping Fort (which, like Tothill Fort, would have been as close to the river as was practicable) was probably located on the ridge (once known as the Rad/Redcliffe Highway) that the Highway cuts along today. The natural topography would have given the fort a commanding view over miles of the surrounding fields. It would also have had access to the river water while avoiding the mudflats. In talking about the Utopian enclosure of London, we are talking about the most basic things: the blood, sweat and fears of attack. Earth, turfs to bind, spades to move it, hands to hold, steady and push, anecdotal memory to sustain the fear, the conviction and our knowledge today. Put yourself in the collapsing footwear of one of the thousands of city porters who were seen digging the trenches by witnesses including the Venetian ambassador in May 1643. Put yourself in their heart and feel the thrilling pull of change, feel the drama of possibility, of something better than what is, and push, encourage, fight on. Let’s scroll northwards, along the lines as they dry out towards White Chapel Mount (or Fort), at the meeting place of Whitechapel Road, New Road, and Vallance Road. We are back at Mount Terrace, the little green inclines to its north on the main road west of the Royal Hospital. Today, the corner of the hospital is a helipad, which services the NHS air ambulance and offers astonishing views of the east face of the City. From here the topography and sense of landscape of the seventeenth century is, in a sense, recovered. Directly to the south is St George-in-the-East alongside the towers of St George’s Estate set around Swedenborg Gardens. In between looms the Southbank, with the final fort site, off Jamaica Road, visible to the west of modern Rotherhithe, and stretching towards South London’s distant hills. Looking north-west along the communication lines, the eye follows the spikes of Hawksmoor’s Christchurch and the Truman Brewery chimney on Brick Lane itself, to St Leonard’s Church at Shoreditch just above the red roofs of the Boundary Street Estate – alongside the site of Shoreditch Fort. Immediately to the east is Sivill House, designed by the great Utopian architect and planner of London’s mid-century, Berthold Lubetkin. From Whitechapel’s helipad the top flanks of Sivill House reach skywards from Lubetkin’s Dorset Estate, with its two propeller-plan towers connected by a circular public library. What did Lithgow see here? Well, he didn’t see the hospital that was founded by voluntary subscriptions in the middle of the eighteenth century. He didn’t see William Beller’s 1752 visualization of it, set in open fields, nor Chatelain’s wider-angled etching (based on Beller’s painting) a year later. The etching’s south-easterly view of the Mount, from the corner of modern Vallance Road, shows it looming over the hospital, its flat top crowned with mature trees and a folly. The folly’s views south – of St George-in-the-East and perhaps the river itself – were from almost exactly the same angle and height as views from the helipad today. Lithgow would have seen something similar to what John Rocque saw a century later, when preparing his London map of 1746, which shows a number of likely Civil War earthworks. He would have seen a field east of White Chapel Fort, an earthwork built in all probability on a rocky outcrop like that running along The Highway to Tower Hill with ‘the ground thrown up in digging the trenches used to enlarge it’. The mount’s size became an issue when the City decided to develop it in the mid-nineteenth century. The hospital fought off plans to build on top of it, and forced the City to remove it before building Mount Street, of which Mount Terrace – with its City badges – is the remnant. White Chapel Fort, one of a planned system of defences and communication networks, is linked to another site where Utopianism, war, defence, mud and a notion of collective consciousness cohere; another site loaded with a consciousness of London as a whole. I am referring to Finsbury Fields and work that sprang from the 1930s Finsbury Plan – so fully embraced by Lubetkin and his Tecton colleagues. Although these are extraordinarily rich interlocking histories, I will focus on just one aspect: the plans for a system of defences against the Blitz. This link is triggered by the location of the strongest section of the seventeenth-century fortifications, built in expectation of a Royalist attack from the north. Waterfield Fort was at the top of St John’s Street, exactly where Spa Green Estate stands today, linked eastwards by trenches running along Sebastian Street to a huge fort at Mount Mills off the Goswell Road. Westwards, the lines cut to New River Head’s circular reservoir and on to Mount Pleasant, east of Black Mary’s Hole and another city dump. 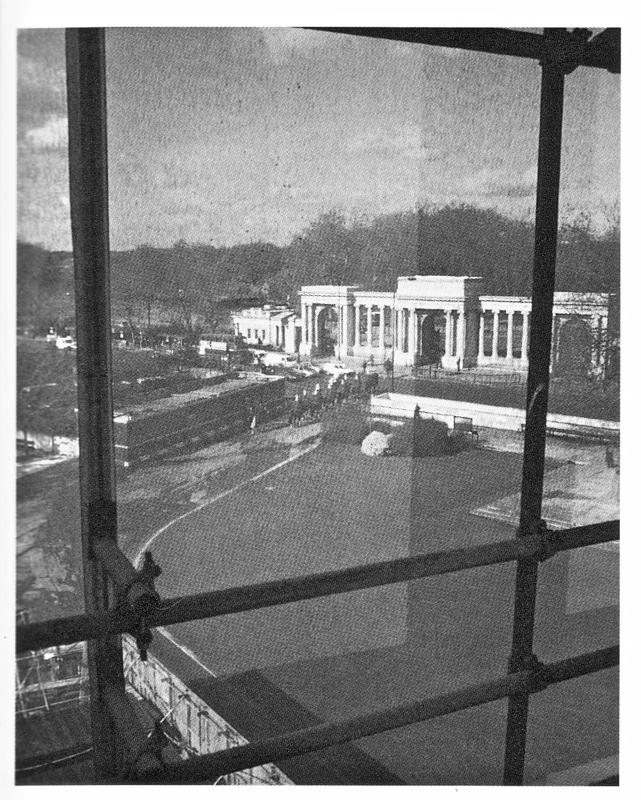 In between, a covered walkway was cut up the hill that is now Amwell Street, to Islington Pond, which would soon became the extant reservoir in Claremont Square. The forts mark an area known for its spas and radical reformers and which, in the seventeenth century, Wenceslaus Hollar represented in a series of etchings showing extensive earthworks. They protected an area that would become the site of the largest and most ambitious plan ever for the social regeneration of London and which remains a paragon of what could be achieved with social housing. Spa Green, Bevin Court and Priory Green just north of Finsbury are all positive manifestations of a politically committed and revolutionarily ambitious approach to collective works, but – conscious of what there was to fight for – Tecton also produced a plan for an elaborate system of defences and network of communications with uncanny echoes of the Civil War forts. Faced with the threat of aerial bombardment as a prelude to invasion by the Nazis, Tecton devised a plan to protect the Finsbury ‘crowd’ that was as radically ambitious as its housing plans. No expense would be spared to protect the people for whom the war was being fought, whose relatives were fighting the war, who produced the supplies and morale to defeat Fascism. It therefore involved the same principles and soul-striving that created the need for, and actuality of, the Civil War defences. Tecton’s scheme is extraordinary,  putting every citizen within easy reach of deep shelters housing up to 7,600 people. These inverted forts were little circular Utopias in themselves, as Tecton’s visuals suggest. They were also part of an elaborate system of interconnected circles and lines – a complex analysis of the utilities and future uses of the area that was taken into consideration in the planning. Lubetkin, let us not forget, was a revolutionary, whose exasperation with the persistent vandalism of his publicly funded Lenin memorial led to its investment in the foundations of Bevin – originally Lenin – Court. As a result, the organizer of the Russian Revolution is now only commemorated by a plaque that marks his visits as a refugee to neighbouring Percy Circus. Tecton’s revolutionary scheme caused an outcry – press attention and governmental panic, which ended with them being branded subversives who were threatening to bankrupt the war effort with such ambitious schemes. The plan was spurned, the people evacuated and these defences joined their Civil War ancestors as traceless, virtual Utopias. I descend at once to… the vilest. I can descend no lower. If a place could exist in no neighbourhood, that place would be Tothill Fields. It should not surprise us that a zest for a brightening Utopia is necessarily bound to the muddiest mud, the zeros of death, devastation and obliterating war. It should not surprise us that Parliamentarians built a Utopian enclosure out of mud, that Jeremy Bentham planned to build his quasi-Utopian Panopticon – the over-theorized icon of all-seeing circularity – in the ‘no neighbourhood’, no-place of Tothill’s swampy fields. It should not surprise us that the most Utopian and politically vigorous social-housing enclosures were built on the rot or rubble of nineteenth-century dereliction and Nazi bomb sites. What of this Utopian circle? What of this figure that links underground particle accelerators in Swiss mountains with the formations at Stonehenge and Avebury (reinvested with Celtic significance by William Stukeley)? Let us draw together the research and trace out our revolutionary circuit up to 1999. Like Vertue, we shall start at Wapping Fort [1 on his map] and follow the Lithgow line in an anti-clockwise direction to finish at Redriff Fort, opposite Wapping, on the Southbank. Wapping Fort is well placed at the top of Wapping Lane, adjacent to St George-in-the-East. From there, lines are well documented going north along Cannon Street Road to the second fort, at Whitechapel. This was still visible until its removal in 1830, and its sheer size reminds us that these earth mounds cover a large area on a modern map. From here, things become less settled. There are claims for a fortification halfway up Brick Lane – located by scaling Vertue’s map to a modern A-Z and putting a pin in the heart of Kray Brothers’  territory. In the absence of accumulated evidence we shall scroll to the well-documented site at the very top of Brick Lane. Most records place this fort  just to the north of Shoreditch Church (which antedated it), close to Hackney and Kingsland Roads (the latter of which was a major northward route for the King’s mail and was probably fortified ). Other clues here are the former Mount Street – now Montclare Road – on the eastern perimeter of the Boundary Street Estate, up to Virginia Road, previously known as Castle Street. Castle and Mount Streets met north-east of the Boundary Estate and Shoreditch Church, immediately south of Hackney Road. There is a marked incline in Montclare Road here, which is where I would place Shoreditch/Brick Lane Fort , immediately beside one of London’s finest experiments in Victorian social housing, the protective enclosure of Arnold Circus. Haze regathers here, with no definitive lines connecting these forts as they passed north of Moorfields, up until the next well-documented fort at Mount Mills. Archaeologists have reported possible seventeenth-century ditchworks along the southern rim of Hoxton Square,  which was developed from fields after the Restoration in 1660. This is consistent with the overall line and a suggestive nexus of clues that place the fort described at Hoxton close to where City and New Roads split, north of Old Street roundabout. This was open land in the seventeenth century and Rocque’s eighteenth-century map reveals the notably angular lines of ducking ponds and a Pesthouse Lane – both common features of fort sites. Then there are the associative names: Castle Street, Mount Row and Oliver’s Yard that have congregated here too. So, Hoxton Fort  could well have been here – near Ebenezer Street – protective of the City and its northwards flank. Next is Mount Mills , apparently a large fort and the first to be built – between Goswell Road and Central Street, north of Seward Street. A century after the fort’s construction, both Thomas Pink  and Mortimer mention a very large mound at Mount Mills. The site was also a burial pit, windmill, plague pit and a public laystall – like Mount Pleasant. Today, Mount Mills is a slip road behind the Pheasant and Firkin pub on Goswell Road and opposite the Triangle Estate – a most fort-like example of social housing. From Mount Mills, evidence points to lines running along Sebastian Street towards St John’s Fort . Lithgow described ‘footing along the trench dyke (which is three yards thick and on the ditch side twice as high)… [at] the lower end of Islington where there was a ‘strong and large strength called Waterfield Fort,’ with the largest ‘court du guard’ that he had as yet seen, ‘larger than two ordinary churches’. I believe this to be the site of Lubetkin’s Spa Green Estate. This claim has not been made before, and is based on three pieces of evidence: a combination of old local maps; the name of the Fort being Waterfield; and, most crucially, the discovery of an engraving of the new Toll Road and Gate linking St John’s Street with Rosebery Avenue. That print shows a mound exactly where Spa Green is, a location once known as Waterfield, and the estate bears a plaque commemorating the toll-gate itself. Finsbury’s Forts are well documented. From St John’s Fort the lines went to New River Head, a circular reservoir at the end of the New River that Sir Thomas Myddleton built linking it to Amwell in Hertfordshire. In 1739, Maitland himself records visual evidence of lines across these fields, linking the fort at Black Mary’s Hole, or Mount Pleasant, with Merlin’s Cave just west of New River Head. A covered Line, he wrote, went up to the Upper Pond. This is now Amwell Street, which follows an old pathway, and the Upper Pond is Claremont Square. ‘A little farther on’ (‘about ten pare buts’ from St John’s Fort) Lithgow came to Strawes Fort , or Fort Royal, on Islington Hill. This was a very elaborate fort with ‘eight angles and a spacious interlacing distance between each of the covered bulwarks’. It was a specially high ground, ‘marvellous perspicuous and prospective both for the City and country, commanding all the other inferior fortifications near and about that part of the enclosing ground’. The natural topography here, rising to the plateau of Islington, makes the importance of this fort obvious, and concludes this part of the defences. Mount Pleasant Fort, sited underneath the modern Post Office sorting office, was also known as Wakefield or Pindar’s Fort. This is a frequently described location, and the Mount itself was an ironic name given to a notorious dung hill. Soldiers were known to camp immediately north of here in fields typically used for archery and duels. From Islington, Lithgow descended to Holborn Fields where he came to Pindar of Wakefield’s Fort , evidently on the right of Gray’s Inn Lane, and the one styled by Vertue ‘a Battery and Breastwork on the hill east of Black Mary’s Hole’. It is a natural site for a garrison and defensive position. From here we go west through the old Conduit Fields, more or less along Great Ormond Street, land owned by Rugby School, to a clearly documented fort  at Southampton House. Several maps show a fortification in the rear gardens of Southampton House – which opened on to fields – for at least a century. The site is now beneath enclosed gardens south of Russell Square, which remain part of the Bedford Estate. The fourth Earl was a fierce Royalist, which makes what is the reliable siting of this fort ironic and pleasing. Bloomsbury Square was developed by the Earl as the first such square in London (and the world), as well as the origin of the now notoriously feudal – but extant – law of leasehold (established as a means of developing land around the square). From Southampton Fort, the lines went below the modern British Museum, to St Giles’ Fort , variously located along Tottenham Court Road, north of Centrepoint – the site of the Pound – and east of the high street at Bayley Street (where Rocque shows earthworks). It is unclear how many forts guarded this vital northwards route. The Common Council ordered two defences here, and records put a ‘Crabtree Fort’ in the fields opposite modern Bayley Street. From here, various forts are described in locations that range from the north end of Wardour Street to ‘Maribone Fields’. I would place Wardour Fort  at Market Place, which has Castle Street impaling it on an east-west axis and inclines to suggest an ideal defensive position in this vicinity – near Crabtree Fields en route to Maribone Fields. From Wardour Fort the lines are again unclear but head to Mayfair and the next reasonably well documented fort. Mount Street Fort , or Oliver’s Mount is best sited at Mount Street itself. It was probably where Carpenter Street meets Mount Row as it rises from the south to a plateau in the Grosvenor Estate – then just fields. The subsequent history of names – Mount Street (or Row), Oliver’s Mount pub and the Mount Coffee House – bolsters this (and links the site to England’s poet of Romantic dissent, P. B. Shelley). Today, the only public memorial to London’s forts  takes the form of a couple of sentences recounting the story of Oliver’s Mount on a notice-board in Mount Street Gardens, a notably pleasant enclosed space between Farm and Mount streets, east of South Audley Street’s chapel. From here, part of the lines have been established as they venture towards, and then across, modern Park Lane to Hyde Park Fort , which cannot be conclusively located. It was probably in the south-east corner of the park, in an area between the circular fountain opposite the Grosvenor Hotel and the west end of South Street – a link traced today by Lovers’ Lane. Lithgow wrote of ‘departing thence shortly encroached upon Head [sic] Park Corner fort, which is a main great strength having one fort above and within another; another third fort closing the roadway standeth breasting the other two’. More recent research  describes a very considerable fort, matching Stukeley, Lithgow and others, as well as making much of extant earthworks mapped by Rocque in 1746. This is the only fort site that has retained its essential topographical relationship to the city from the seventeenth century, opening up to the whole western flank of London as it dips away and protecting the two main roads westwards to Oxford and Reading in this perfect defensive position. There was also a Fort at Constitution Hill , at the top of the route that leads from Buckingham Palace, now the site of Hyde Park roundabout where the Wellington Arch, originally designed as part of a grand entrance to London itself, pairs the arched entrance to Hyde Park to the north. The arch’s history  is full of architects, including Soane, disappointed in the quest to create a new face for London, opposite Wellington’s home, No. 1 London. It arrived at its present site in the 1880s, in yet another re-jig of this crucial junction, and is now being restored for use as an information centre, which will offer a view down Constitution Hill towards St James’s Park, Westminster and the Millennium Wheel. The arch presently houses a ventilation shaft for the underpass in the space of old prison cells, a residue of its use as a police station for many years. The high symbolic loading of this site is further increased by its use as a route for the changing of the guards housed at Basil Spence’s nearby Knightsbridge Barracks and it will be the pivot in a figure-of-eight memorial walkway for Diana, Princess of Wales. Constitution Fort was linked, via small defences on the Chelsea road (now the greenery of Grosvenor Gardens), to another large Fort  in Tothill Fields. (Tothill or Toot Hill means ‘the highest ground in an area which could be used as an observation post for the erection of a beacon’.) Here was a large, open field with pesthouses, ducking ponds and, later, a maze, the no-place of Jeremy Bentham, an excellent vantage point that reached as far as modern Tachbrook Street. Lillington Gardens Estate now occupies the likely site of the fort. Bentham never did build his reforming panopticon prison, but a crude and notoriously grim version was built nearby: the Millbank Penitentiary. On the map its starred circular form resembles Arnold Circus and, after it was torn down, a part of the site became social housing modelled on the Boundary Estate – with blocks named after artists including Hogarth – the remainder was dedicated to the Tate Gallery. The lines continued south, to the river and beyond, linking, on the Southbank, to the large Vauxhall Fort , very close to where the pleasure balloon rises and falls today. Defoe, as well as several other reporters and map makers, placed the fort within Vauxhall Pleasure Gardens, a popular Restoration haunt. The Elephant and Castle pub is now thought to be a site marker – the seventeenth-century spelling of the exotic ‘Oliphant’ linked to the Protector’s ‘Oliver’  – and is part of the messy agglomeration that is Vauxhall Junction. The site today offers views across the gentle incline of the Vauxhall Gardens Estate (looking east across Lambeth) beneath the all-seeing home of the secret service, MI6, on the river nearby. North-east of here the lines connect again through modern Bermondsey and its old tanneries to Grange Road Fort, at the junction with Spa Road – exactly where Bermondsey Spa was – and once marked by nearby Fort Road, Fort Place and the Fort pub. Finally, the lines headed riverwards along Spa Road towards Rotherhithe, stopping near the river and joining Redriff Fort, which is mentioned by Lithgow. This fort has little site evidence, but was probably in the north-west corner of the modern Southwark Park, where Prospect Street runs northwards towards the river on a line that would link to Wapping Fort on the northbank, at Wapping Old Stairs. The Angel pub, founded by monks from the Bermondsey Abbey, marks the line on the Southbank. Alongside is a recently excavated royal palace site that has extensive information boards that include the phrase ‘protected by an Act of Parliament’. That collective will was established by the building of civil war fortifications nearby, about as close to the river as it was possible to get, but no archaeological work has ever been done to prove it. In the seventeenth century the view east would have extended over farmers’ fields flanking the Thames for miles, and over the river and mudflats the next fort in the circuit would have been clearly visible, just beyond what is now a circular bandstand. So, here is our Utopian band of mud in all its glory. Homeless drunks, soberly marvelling at the view of Spa Fields from the top of Michael Clifford House, Finsbury Estate. May 2000. It was not unusual on passing the Lubetkins’ farm [during the World War II] to observe a Hippopotamus pulling a harrow, or a chimpanzee driving a tractor. The building of barricades appears in Fourier as an example of ‘nonsalaried but impassioned work. Cabinet-makers, marble masons, market porters, upholsterers, matchbox-makers and cat’s-meat sellers lived in the notorious 15 acres of Victorian slum that pre-existed the Boundary Street Estate in Shoreditch. On the 9 May 1643, some 20,000 Londoners – men, women and children – were out digging trenches. Through May and June felt-makers, cappers, porters, shoe-makers and tailors (as well as members of many City guilds) continued forting for the Revolution. These are the people that make up the numerous anonymity of the crowd, and it is in the name of the crowd, in the name of an abstract collectivity or politicized body, that vigorous social change is engendered and ethical acts are possible. The Utopianism of the English Civil War resurfaces in the social housing of nineteenth-century industrialism, as well as mid-twentieth-century tower blocks, designed to provide better lives. The English Civil War forced and concretized symbolic change on the country via the beheading of Charles I on a platform outside the Banqueting Hall in 1649. The Boundary Street Estate was the most ambitious example of social housing yet built after the Housing of the Working Classes Act 1890 (it included a laundry, for example). Indeed, it was so remarkable that a reform-minded Prince of Wales chose to open it and plans were laid for the construction of a platform for him during the opening ceremony. From this vantage position, the Prince was able to recognize the previous slums as a ‘disgrace to our civilisation’  – an event that is reminiscent of Lord Curzon’s viewing platform by the walls of the Hindu Lingaraj Temple in Orissa, which enabled him to look inside the enclosed walls of a distant, other world. Three different platforms and three different places, but all conditioned by scaffolding, all literal versions of a symbolic relationship and so all stagings of a certain potent ambiguity. This is the defining motif of, and relationship to, so much of the city’s social housing – the fort-like enclosures that isolate and block out the world, forcing attention inwards rather than being porous, inclusive, and in rhythm with our millennial experience of life. The high blocks around Arnold Circus appear to exemplify this kind of fortress-like enclosure, but once inside the estate, standing in its raised centrepiece gardens, this perception is inverted, and it becomes a haven into which the sun shines and from which you can look out. It is a reminder of the high hopes for the estate, designed so that ‘every habitable room in the area is provided with a 45-degree angle of light, horizontally and vertically. The buildings are so arranged that nearly every room commands a pleasant outlook’  on to 60-foot-wide circulatory avenues. This replaced 209 streets, the widest being 28 feet, with an average density of two people per room and 107 rooms sheltering at least five. The shower of light brought down on these same people was certainly a visionary one. The forting circuit has an uncanny number of significant estates along it, and they tell the story of housing for the London crowd, from Arnold Circus, Spa Green and Lillington Gardens to the Heygate, St George’s and the Triangle. Lubetkin’s Utopian commitment provided facilities and a degree of quality that rivalled private housing in the mid-century. Today, when most local authority housing comes cheap, flats in Spa Green are worth more than the average house price in London and it resembles a private estate. 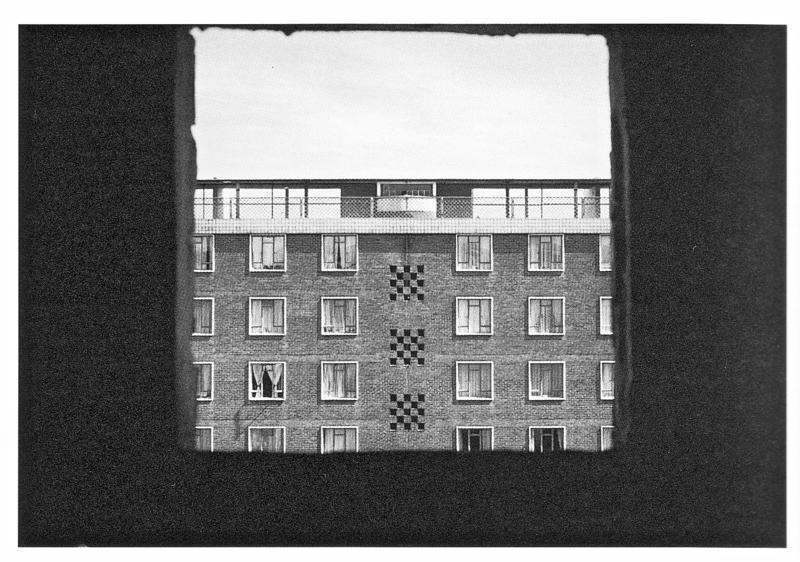 Even the most compromised of Lubetkin’s projects were aimed at improving the quality of life – spaces, light, facilities, design itself, trees, gardens, openness of aspect, non-regimented space, non-enclosure and even the provision of astonishing views from Bevin Court’s unique stairwell, or the walkways of the Dorset Estate, where hugely expensive slabs of the city are on offer. These qualities are usually prohibitively expensive and the very idea of such standards applied to government housing today appears amazingly ambitious. 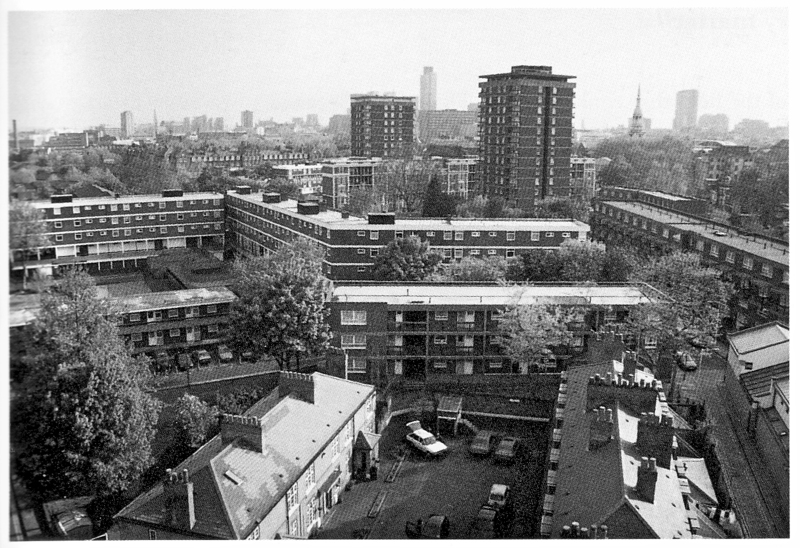 Most social housing resembles the massive Heygate Estate near the Elephant and Castle Fort site, with its massive single block approach, regimented accommodation, high density/false economy and lack of communal facilities. Lillington Gardens Estate was also built in the 1970s, and although it achieves high density it remains resolutely low-rise, incorporating an old people’s home, library, pubs and a school. Lillington Gardens is also more ambiguous in that it has many of the features of a private housing estate, open green spaces, mixed usage and accommodation, and the feel and appearance of higher quality housing. The Triangle Estate on Goswell Road, completed in 1970, exemplifies many of the worst features of social housing, being brutally fort-like in appearance and feel. It is designed around a barren inner triangle from which the walkways look down and which is typically empty. 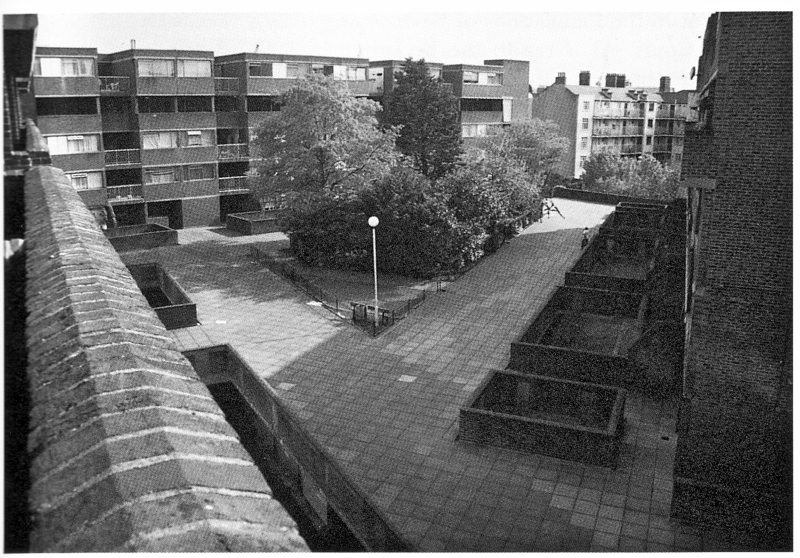 Separate blocks are joined by walkways which have blocked any views, making the place feel exceptionally oppressive and symbolizing the failings of much council housing. Since the estates were built with collective will, they ought to be part of the city that has built them, open, continuous with the city’s flows, most particularly in the twenty-first century with its technologies that mirror these attitudes. Governments have successively built enclosures like forts or prisons, containers for the poor, who are prevented from flooding out into the city – non-contaminating blocks of exclusion. The Triangle, which is adjacent to Mount Mills, inverts the principles for which the fort was built, a reversal of the notion of an empowered collectivity: the crowd. Here is the crowd’s burial site, its neglected cemetery. From the vantage points of these estates the seventeenth-century topography of a city in revolt is recoverable. Each of these city beacons is now visible from one another, but their connective, communicative power is disabled, unutilized and unarticulated. It becomes our urgent task to re-thread these spaces, places and times, to articulate a new crowd consciousness, and it is for this that our revolutionary circuit is designed. It allows us to do two things. Firstly, to recover a particular innocent ambitiousness about how we should live. We are reminded that all periods of significant change were preceded by conservative stases with their own ends of history and bloated pragmatism. Today, in newly globalized times, we are uniquely conscious of the grotesque and barbaric inequalities that characterize our planet, which force and guarantee radical change to come. There are opposing continuities or historico-cultural strands. The forting circuit and Lubetkin’s committed architecture are linked in their quest for something better – concrete embodiments of extravagant Utopian demands for answers to a question about how we should live. Our muddy Utopia also allows us to invoke the other use of the term scaffolding – associated with rebuilding, dismantling and beginning. The scaffolding condition is one of permanently mobile change. Once recognized, the question becomes one of passivity versus activity. Are we the passive material upon which change is worked, or the active shapers of it? Since we can and must be the latter, then we must also articulate that necessity. So, instead of being globalized, we need to begin to think through how to embody a positive global body, one of civility infused with Utopian vigor, resistant and actively opposed to the merely economic logic of globalization. The forting circuit is an example, a reference, an articulation; a small step. But it taps this kind of potency – these communicative possibilities and Utopian energies – by offering a new way of thinking about the city, the whole of the city, its embodied collectivity: a new way to construct an enclosure within which to speculate, theorize and dream. This is the impassioning work of dirty Utopianism. The English Civil War began in 1642, when, following bitter disputes over ‘the liberties and privileges of parliament’, ‘innovations in matters of religion’ and grievances over property rights and taxation, Charles I abandoned London for safer Royalist enclaves in the north. Parliament, in alliance with the City (which, when neither King Charles nor Parliament had an army, possessed a proficient militia) had revolted against his autocratic rule. The king’s failure to retake the capital (having reached its outskirts and ‘sacked’ Brentford only to be repelled at Turnham Green) sealed the outcome of the war. Charles surrendered in 1646 and was returned to London by Oliver Cromwell’s parliamentary force, the New Model Army, in 1647. Against a backdrop of Royalist uprisings across the country, the unrepentant king was executed in London, before Banqueting House, in 1649. Cromwell became Lord Protector of the united Commonwealth of England, Scotland and Ireland in 1653, which marked the end of the period of radicalism in London; he died in 1658. London had lost its unity of purpose. The restoration of the monarchy, in the person of Charles II, occurred in 1660 and that settlement was guarded by constitutional reforms. First published in AA Files 42 © The Author © Architectural Association. 2001. А! Je me demande maintenant si nous pouvons parler de vos statistiques de sites – le volume de recherche, etc, je suis en train de sites que je peux acheter par le biais adspace – permettez-moi de savoir si on peut parler de prix et ainsi de suite. Cheers mate vous faites un excellent travail bien. Thank you; I’m flattered by your question and the traffic there is to the blog but don’t want to advertise or commercialise it in any way. Just fyi I never once -really! not once ever in 9 years- looked at the traffic to my old website; I really don’t want to know. Any links to sources for a book or anything else here are just that. I’m elaborating just to be as clear as possible and with other similar queries in mind. However, I mean it when I say thanks for having the thought!